Peter and Ann decided to treat me to a dinner at Spud's, in Rowley, south of Newburyport. Rowley is one of the charming old New England towns, scattered by the coastline north of Boston. Spud's would not be the place to eat, if you want to enjoy fine dining and wines in a romantic setting. If you, however, lower your expectations, it is not a bad place to eat. My review is based on that. But If I could choose again, I would have eaten at a place with more character. It was relatively easy to find, as it was close to by the main road leading into Rowley, but you need to have a car to get there. 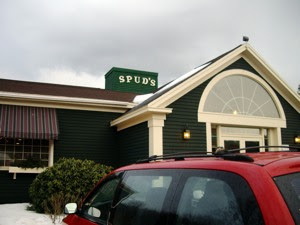 Sadly Spud's was located outside this beautiful old town, by a mall. Locationwise, it was hardly a perfect place for a romantic dinner. The interior of Spud's reminded me of a combination of McDonalds and a good old american diner, wooden tables and leather / plastic benches. No formal table setting, no plates, no forks or knives, and no glasses. Spud's menu was interesting and the prices are very reasonable. Buffalo Chicken with Bleu cheese Alfredo penne for $10,99? Steak tips & Crab Pie for $16,99, sounded mouthwateringly tempting. I wanted to hire more stomach space and taste them all, but sadly I had to choose, and I ordered the Cape Cod chicken at $9,99. And it was worth its price to the last (lacking) penny! Professional service and we did not have to wait long for food or drinks.